Extending Your Growing Season in Winter: Can Your Garden Survive the Cold? If you live in cold weather regions, extending your growing season with hoop houses and cold frames could save your crop and even your life, if it means the difference in whether or not your family has enough food to eat. Winter is here, and you might be wondering what to do to protect the garden you’ve worked so hard to build up and produce food for your family. Gardening, seed saving and raising significant amounts of your own food all take experience, hard work and favorable conditions. There’s no doubt that any serious prepper should be at least thinking about raising food, but it won’t be enough until you put it into practice. There are a number of homesteaders who focus on gardening as a form of sustainable prepping. In these videos, they explain the relatively simple techniques to keep your cold hearty plants alive during the winter months – even through extreme cold and extended snowstorms. Long term, a vibrant homestead garden may be the only way to guarantee your food supply lasts, allowing you to sustainably replace what you have on hand. Storing purchased food may never be enough, particularly if an emergency or collapse means empty shelves and shortages, or if you are cut off from civilization, such as in a prolonged snowstorm, outages or road shutdown. Few of these purchased, stored foods can come anywhere close to the nutritional value of what you can grow yourself, anyway. As Patrick Dolan of One Yard Revolution explains, defending your winter plants and extending your growing season is more about keeping plants alive than making them abundant producers. That is because plants are basically dormant during most of these months, meaning that regular watering becomes unnecessary and even counterproductive, while most plants are growing only minimally. Dolan focuses on four basic tasks to make cold frame and hoop houses a success: setting up and taking down at the proper time; appropriate venting; clearing snow and ice; and the best part, maintaining a continuous harvest. It is important to know when to set up and take down cold frames, as well as when to add coverings to hoop houses, which is usually best once temperatures have settled significantly below freezing – perhaps -20 degrees Farhrenheit. This technique works best for Hardiness Zones 4-6, where annual temperatures regularly drop below negative and often dip as low as -25F. Cold frames may still be useful in Zone 7, but may have minimum usefulness in Zones 8 and higher, or the coldest Zones in 1-3. 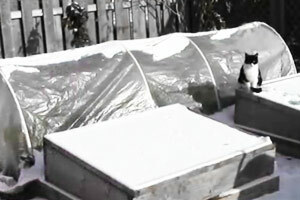 Cold frames should go up in late fall once temperatures are well below freezing, such as when temperatures reach 20F. They can be constructed out of simple wood frames stacked on top of raised beds with framed glass placed on top. Used or found windows can make great cold frame lids, too. Optionally, these can be hinged onto the wood frames to open for venting, but a lower tech approach would be just to slide them down a few inches to breathe. After construction, venting is the most important task to keep plants alive when using these structures, as significant changes in the temperature threaten their livelihood . Cold frames are more susceptible to this fluctuation and need more frequent venting than hoop houses. Nevertheless, Dolan recommends the low maintenance approach – remember this is done during the coldest months of the year in areas with frequent snow and biting cold. You probably don’t want to go out there if you don’t have to! The goal is not to maintain optimal temperatures for your plants at all hours of the day, but just to keep the plants alive so they can resume growth when the coldest weather passes. The main concern is overheating during sunny days when temperatures rise above freezing. Maintaining continuous optimal temperatures, on the other hand would require baby sitting the plants, venting frequently and heating the structures, requiring extra equipment and effort. However, if you have the luxury of maintaining these conditions, it may help boost your winter harvest. Hoop houses only require venting a few times throughout the season; even cold frames require only a handful of venting sessions. Snow removal is as simple as using a broom or brush to clear frames and hoops so that sun can reach the plants. However, this need not require constant attention either. Any day overcast and gloomy enough to produce heavy snowfall isn’t likely to bring significant levels of sun; clearing your structures can probably wait a day or two here. For colder regions, these structures are usually removed entirely by April or May, or when temperatures return to above freezing levels. Utilizing these relatively simple techniques also allows you to continue harvesting fresh veggies during the coldest months, often several times per week. The most important tip Dolan provides here is waiting until midday when the sun is shining brightest, and insuring that plants that are frozen aren’t harvested from. Brassicas – including kales, cabbages, broccoli, cauliflower, Brussel sprouts, mustard greens and turnips – are king of cold weather crops, which survive and often thrive in the winter months and cold season. They are also prized for their nutritionally dense produce and amazing flavors. Some brassicas, especially kale, not only remain hardy during freezing weather, but have long been reputed by farmers to taste better after a light frost! Most summer crops, such as cucumbers, okra, peppers, summer squash and green beans, will not survive cold weather and many will die after the first freeze. However, with proper crop rotation, planning for winter months, and sustainable, permaculture practices, serious gardeners will be able to maintain a fresh food supply during all times of the year – even without specialized equipment or greenhouses. We have been using high tunnels (hoophouses) löw tunnles with spun bonded row cover and raised bede here in Alaska at 62 degrees north latitude for several years. We produce canning quantities of tomatoes, green beans and cucumbers in zone 1 or 2. I have found a little extra protection or heat in May when we have lots of light gives more result than trying to extend into October after the equinox is past. Of course we are getting frost tolerant stuff earlier and later as well.